A recent Climate Justice report compiled by Graduate Fellow Christina Schlegel in the Office of City Council President Michelle Wu highlights the need for the City to consider economic and social equity as plans for climate resiliency begin to unfold. Urge the creation and use of a climate justice or climate equity checklist for future development projects. Interviewees requested that future development projects receive more scrutiny before they are approved. How will these developments change the area for residents currently living there? Are developers of buildings close to public transportation adequately resourcing the city for the expected transit use of future tenants and owners? How do new luxury apartments, offices and homes affect livability for current residents? 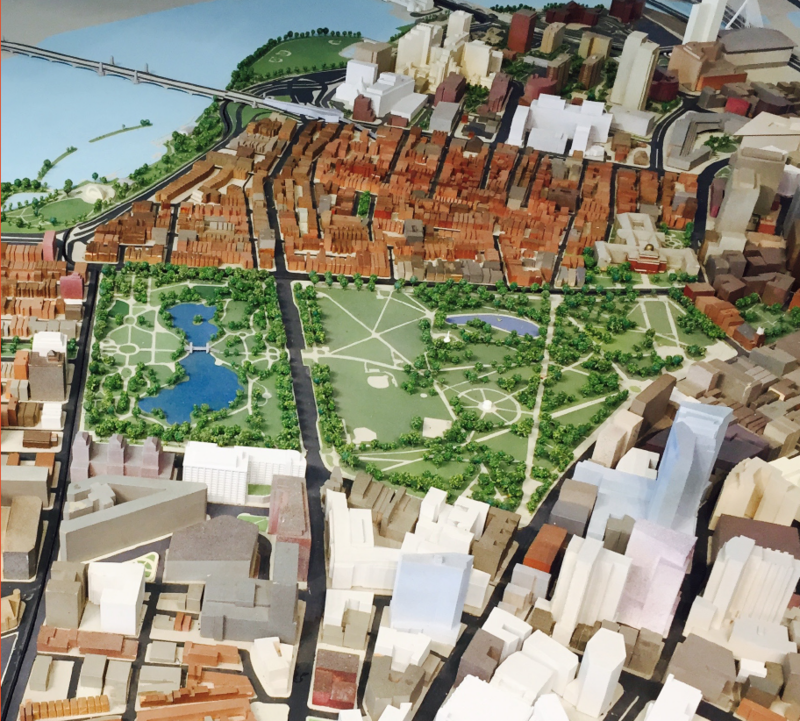 As mentioned at the We Are Boston’s Waterfront meeting last month, Climate Ready Boston has a long list of recommendations for the Boston Planning & Development Agency around development and zoning regulations, but there are no set requirements. Host community listening and progress update sessions in neighborhoods across the city, particularly in environmental justice communities. This would open a clearer path of engagement between local residents and government organizations. Community members would learn about actions the City is working to implement in their neighborhood, which would help address existing concerns that the City is not focusing on climate resiliency plans in a particular neighborhood. City officials could also hear concerns and requests from residents living through climate change in that area. Require that future city plans and projects contain timelines and easily accessible updates. Climate Ready Boston Progress chart. Climate resiliency planning has gained more attention in recent months as the effects of climate change are being experienced firsthand. With this has grown a sense of urgency from local residents to see action unfold. 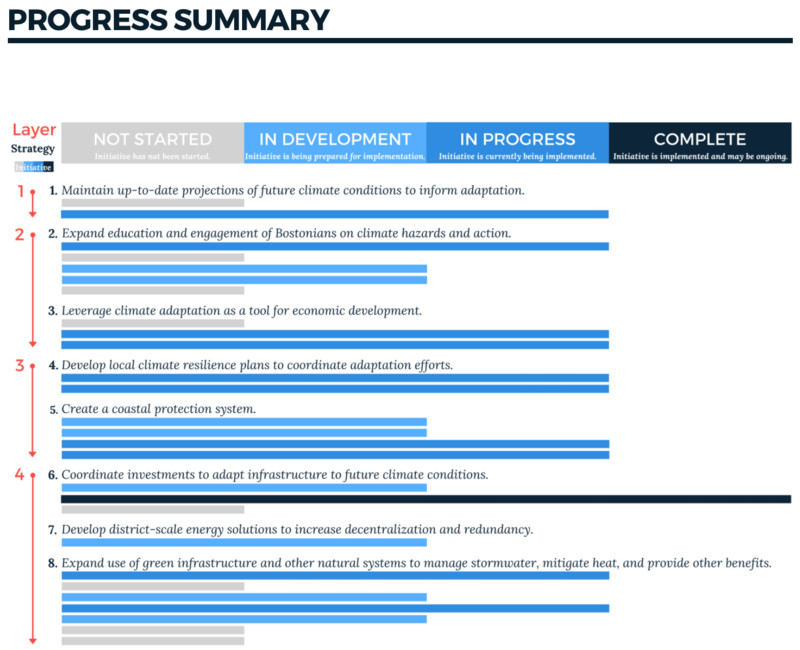 Currently, the Climate Ready Boston progress bar displays initiatives as “not started”, “in development”, “in progress”, and “complete”, but does not provide specific dates. Community members want more information on the progress of projects, who is responsible for them, and the end goal. Discuss integrating climate resilience education into the curriculum of Boston’s public schools. Let’s educate the next generation in climate resiliency by building this topic into school curriculums. In addition to in-classroom instruction, interviewees suggested localized field trips and youth engagement projects to learn about sustainable building practices and solar energy. Consider increased funding for EEOS and managed funds for community projects and positions. Many climate actions are funded by non-government groups and foundations. Community groups who participated in the interviews for this report suggested getting the City more involved by providing greater funding to the Office of Environment, Energy and Open Space so that staff and community outreach can expand. There’s also an idea for funding to be distributed to community organizations for local projects that meet city climate goals. These are just a few of the many ideas included in the climate justice report. You can read concerns and suggestions from the interviewees, as well as additional city council recommendations in the full report. Sort of misses the immediate concerns of residents, rats all over the neighborhood, uncollected trash and dog feces. So lets just ignore all that and jump to changing the climate. If we can’t solve the more common elementaary issues then lets move on to the global issues? Councilor Wu seems to be most interested in ways to infiltrate our wallets. Is this why we would pay for parking in the neighborhood?